This is really an intriguing topic and many call it a quack or fake. But is it really beneficial, or not? Acupressure points exist throughout our body. 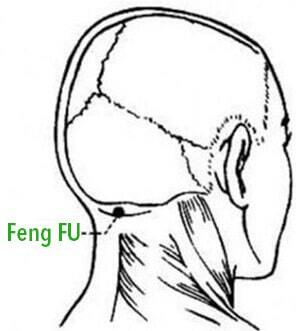 And there is one acupressure point called Feng Fu or GV16. You’ll find this acupressure point right at the base of the skull (check the image below for reference). Even just by pressing this point for a few minutes along with deep breathing is a good way to ease headaches. It takes practice, though. But would putting ice on this point has health benefits? If you search online including social media like Facebook and Twitter, you’ll find a lot of people talking about it. This is based on ancient Chinese medicine. One study has been able to find this point useful in treatment neck pain, headache, colds, dizziness, and many others. The word Feng Fu translates in English as Wind Mansion. Others call it Palace of the Wind. People who are experts in acupuncture and acupressure believe that stimulating this point promotes good health and well-being. How Does It Feel Putting Ice on Feng Fu Point? If you say it’s cold, you bet it is. In my test, a typical ice cube size can last up to nearly 30 minutes. Perhaps, this is dependent on environmental temperature. If you’re in a cold place, then, surely it will last longer and lasts shorter if you’re in hot a place. The first time you put it, it’s really cold. However, the longer you put the ice cube on this point, it becomes more tolerable. In my case, it’s just a matter of a few seconds when I feel I can tolerate it to the end. It is easier to wrap the ice cube in a piece of cloth long enough to wrap it around your head. Then, either lie down or sit relax on a chair. If you’re lying down on the bed, make sure to put an extra towel underneath to absorb the liquid as the ice cube melts. Well, for me, it’s too early to tell. I may not be able to reap much of the benefits of doing this as I don’t have the symptoms mentioned. However, I will keep doing this for weeks to see what would I feel whether it has negative or positive impacts on me. After all, it’s free. The only thing I spend is an ice cube and approximately 30 minutes of my time each time I do it. Most recommendations say it’s better to do this twice a day. So, this is what I’ve done so far. In Chinese Traditional Medicine, stimulating this point does not treat. However, it helps brings balance to the body physiologically. At the same time, it also provides rejuvenation to the entire body and strong life impulse. As a matter of fact, when you do this technique, you’ll feel the pulse of the Feng Fu point. When you press this point for a minute or so, you’ll feel the pulse, too. But, using the ice cube technique, the pulse is stronger. This simply means that energy is flowing. Unfortunately, this technique is not recommended for all. While there are no scientific explanations, pregnant women, people with a pacemaker and those with schizophrenia should avoid using this method. Will This Method Replace Medical Treatment? Definitely, it is not a replacement for any medical treatment. As mentioned, even the Traditional Chinese Medicine says it does not treat but brings physiological balance. Therefore, you should not postpone any medical treatment, or consider this as a substitute for a professional medical procedure. Since this is a natural approach, it can be done along with other treatments. But, if you have critical treatments or medications, always consult your doctor prior to implementing this method. On the other hand, you find in your area a professional and qualified naturalistic doctor who is using similar method who can guide you accordingly. Does Traditional Chinese Medicine Works? Acupuncture and acupressure are both forms of Traditional Chinese Medicine. Its history can be traced back as early as 5,000 to 7,000 years. In the 1960s, TCM began to emerge in in the West particularly in the U.S. In 1967, the Sate of California recognized TCM as a legal medical practice. For the past 2 decades, many insurance companies consider TCM as acceptable services for treatments. Additionally, there are many studies including controlled and randomized trials using TCM. This means TCM works. In fact, it works in China for thousands of years. In Western medicine, the Feng Fu point is situated in the C1 and C2 nerves. Both these nerves have control on sinuses, eyes, sympathetic nervous system, blood supply to the head and pituitary glands. Although all are important, it’s the pituitary glands play a huge role as it is responsible for hormonal regulations. This is a vital part of the body’s endocrine system. The most important benefit from putting an ice cube on the back of the neck is stimulating the pituitary gland to release endorphins. It is a hormone that makes us feel good when it finds its way into the bloodstream. It also acts as a pain blockers. Endorphins are natural morphine. As we know morphine is narcotic pain reliever blocking pain signals from the neuron-to-neuron transmission. This endorphin rush and proper regulation of the body’s endocrine system allows rejuvenation to its natural physiological state. As mentioned earlier, the Feng Fu point is not a healing point. However, upon stimulation, it induces a healing process and allows the body to recalibrate to its natural functions and state. The ice cube technique induces a sense of wholeness, joyfulness and overall vitality.